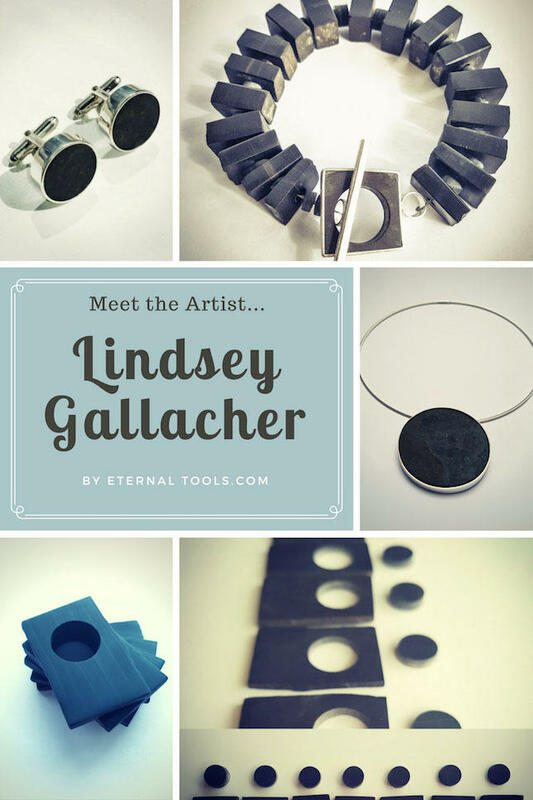 Hailing from the North Coast of Scotland is artist, jeweller and silversmith, Lindsey Gallacher. Her work in wire and more recently in Caithness stone is both inspiring and innovative. I started studying at Edinburgh College of Art in 1996 and at that point didn't have a clue what discipline I wanted to major in. I was told that the jewellery department was excellent and so tried it out. I loved that fact that you could work with a whole range of materials. The world of contemporary jewellery was a new one for me, and even today it still surprises and inspires me. I gained 1st class honours when I graduated and this has helped me to move forward confidently on a number of occasions. Which mediums and techniques do you enjoy working with? I will always love working with silver, and would love to work with 18ct gold more often. For the last year and a half I have been experimenting with Caithness stone, a material that lies in abundance around the landscape. It has been a material I have learned to love and hate in equal measures. I love it for it's infinite possibilities and hate it for it's stubbornness! I work from home, between my garage and my workshop at the back of the house. Caithness stone is very messy to work with, both muddy and dusty, so it's important to keep that away from the house. We live on top of a cliff overlooking Thurso Bay. It's a breathtaking location but also very windy, the view is forever changing. I have always loved the experimental part of the making process, infact I never stop developing and this is why my work is always changing. I love cutting the stone with my new machine, purchased with the help of the Highland Visual Arts and Craft Award. It has allowed me to have a more powerful cutting tool that makes that part of the process more pleasurable. Before, I had to kneel outside with a handheld cutter which was probably dangerous if not a health hazard! I love the process of cutting the stone now, and the enjoyment of making thin slices of stone which I then polish up. I look towards the old methods of natural stone walling, and the patterns that are made along with the layers that occur naturally in the stone which emulate The Flow Country, here in Caithness. Inspiration comes from development and the excitement of discovering something new. 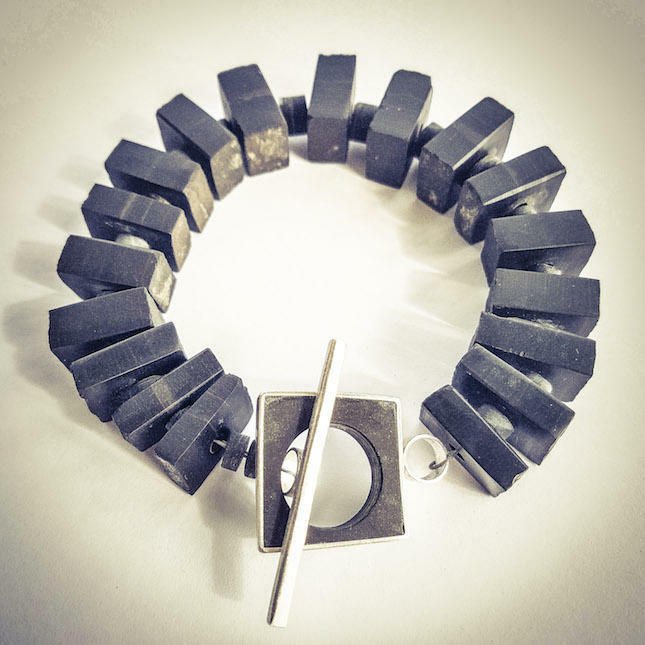 I love the chunky bracelet that I recently made for an exhibition. The contrast between the rough weather worn surface which has been deliberately left untouched, and the highly polished sides of the cubes. I used the inner core of a smaller core drill bit to use as spacers between the bigger beads. I was really pleased when I figured out the solution to what I should use, it was perfect. What drives you on whilst you work? I listen to the radio, switching between channels all day. I have a Patterdale terrier called Paddy who comes and sits with me but usually wants to sit on my lap. I love to watch the waves coming into shore from the workshop window, I'd say that's probably a distraction though! Tell us about where you sell your work, and any upcoming exhibitions? At the moment I am exhibiting in a group exhibition, showcasing the work of 8 contemporary Caithness makers called Made. it will be moving to another venue and finishing mid December. I am in the process of contacting galleries once again after a lengthy time away from making. Currently my work can be purchased in Thurso, Caithness, Scotland. And online. but please look out next year when I hope to have a lot more stockists. What tools could you not live without? And how have Eternal Tools helped with your creations? There are many tools a jeweller needs and can't live without, I still have all my beginners tools bought at the start of college. The most important tools I buy from Eternal Tools are all the different sizes of diamond core drill bits. I need a lot of 1.5mm drills but have a nice collection growing of the larger ones to cut a perfect circle. 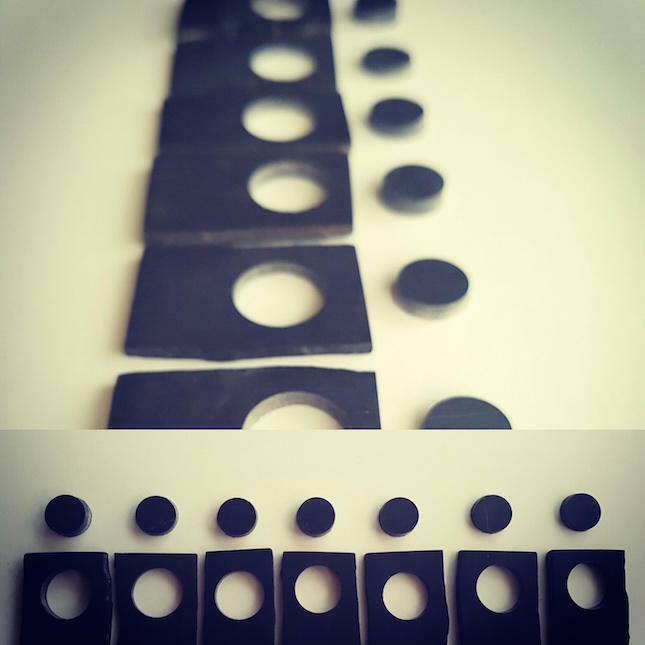 I have had many comments about how clean the cut is of the circles I make. What's the best piece of advice you can give to someone wanting to start up their own creative business? I gave up working for many years to look after my two growing boys. I'd say that it's never too late to start up your own business or even restart. I had a small amount of success after I graduated but now, looking back, the difference is now I really love what I'm making and that feeling is propelling me forward, so love what you make and if you don't love it, make something else! I am being mentored at the moment to help me get back into the jewellery market; a lot of the information I already knew but had to be reminded of, it's been a really great experience so far. My website revamp is nearly finished and I'm working hard on pieces for Christmas. I'm looking forward to lots of new experiences next year and hopefully will be showing at Contemporary craft fairs.